The Discovery Channel special on Ardipithecus ramidus aired tonight. (For any of you who missed it, don't worry, you have a few additional opportunities to catch it if you're interested.) 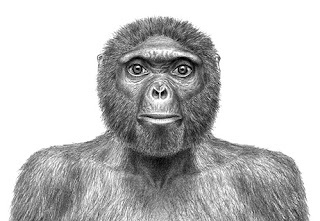 Nicknamed Ardi, this early hominid fossil was discovered in the Middle Awash region of what is present-day Ethiopia in the early 90s. The media has been buzzing with news of her recently—and after the Darwinius flurry earlier this year, I was interested in seeing how she'd be treated by the media and science audiences. But Ardi appears to have been methodologically studied by anthropologist Tim White and team, who uncovered her in the early 90s and have only just permitted their findings to be published, and as a result Ardi has been well received. And the research her bones have permitted have revealed findings that have addressed questions put forth by Darwin himself. Here's the rundown on Ardi: She lived about 4.4 million years ago (mya), and with that number she officially unseats Lucy as the oldest complete hominid fossil known to science. Of course, Lucy, had to have known she wouldn't hold her throne forever—scientists have known about Ardipithecus for a few decades, and they have bone fragments from at least two species who are even older than Ardi: Orrorin lived at least 6 mya, and Sahelanthropus lived in Africa between 6 and 7 mya. Nonetheless, Ardi gets to enjoy her 15 minutes of archaeological fame because work with the fossil record is never guaranteed— and good work with the fossil record requires careful analysis, which means time. But Ardi is more than just "complete"; she gives us answers. Ardi's bones were found in the Middle Awash and her placement in the geological record allows us to understand her relative to Lucy (Australopithecus afarensis) as she appears in a distinct fossil layer from Australopithecus indicating that they did not coexist as a species. Lucy was a fully bipedal, although not without some difficulties. We know this from studying Lucy's feet which lacked flexible bones and had stiff, forward pointing toes. Around 4.4 mya, Ethiopia was a woodland, and Ardi's feet and hands indicate that she likely moved on all fours in the branches of the trees using her hands to pull her along and bear most of her weight (i.e., she was not swinging from branches). And she wasn't limited to the trees: Ardi was bipedal on the ground—and she wasn't a knuckle-walker either. Our closest cousins, the chimps (Pongo) are more specially adapted for life in the trees, which includes knuckle-walking, than even Ardi herself. She gives us evidence that a shift did indeed take place—we left the trees, perhaps due to a shift in social structure, and found our way to the form of Austral. afar. within a relatively short period of time. Research is currently underway on a species that falls between Ardi and Lucy geologically speaking. In time, Australopithecus anamensis may help us understand the (seemingly) rapid progression from Ardipithecus to Australopithecus to Homo. Prior to Ardi, researchers proposed that our evolutionary ancestor from the point of divergence with other primates was chimp-like, and I have heard enough people denounce evolution because they don't believe they "descended from a chimp." Chimp-like was never meant to mean "chimp," and now we know that while our evolutionary branch with Pongo is linked, if the break happened well before Ardi then we may share an ancestor far more "primitive" than either Ardi or whatever "chimp-like" may entail. Ardi gives us another piece to the amazing puzzle that is evolution. For anyone interested in learning more about what the fossil record can teach us, I recommend Your Inner Fish: A Hourney into the 3.5-Billion Year History of the Human Body by Neil Shubin. It's good science writing and will help you understand how scientists work with clues from the fossil record to construct an understanding of our evolutionary history. If anyone caught the special on Ardi, I'd welcome your comments—or any comment you may have on this fossil find. Ardipithecus ramidus and the Paleobiology of Early Hominids . Tim D. White, Berhane Asfaw, Yonas Beyene, Yohannes Haile-Selassie, C. Owen Lovejoy, Gen Suwa, and Giday Wolde Gabriel. Science 2 October 2009: 64, 75-86. 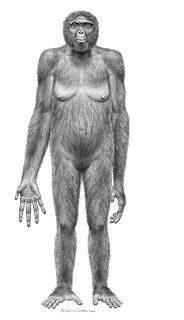 Reexamining Human Origins in Light of Ardipithecus ramidus . C. Owen Lovejoy. Science 2 October 2009: 74, 74e1-74e8. **Photo reconstructions © J. H. Matternes; Bone photo spread © Tim White. Special Edition of Science: Issue devoted to Ardi findings. A free account will give you full access to all articles on this find. Discovering Ardi: Interactive guides to support the Discovery channel special.